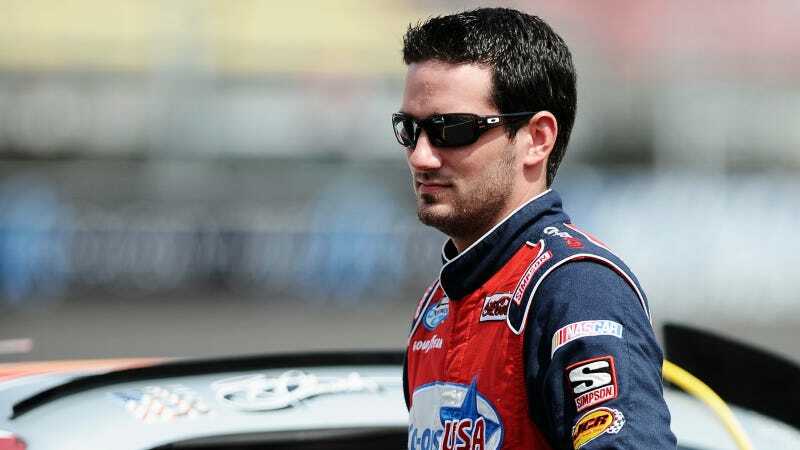 All week long, NASCAR fans have been wondering exactly what racially-charged comment driver Jeremy Clements made to an MTV blogger last weekend that resulted in Clements' indefinite suspension from racing. Well, now we know... sort of. "I was there to do a fish-out-of-water story about going to NASCAR and having a wild, crazy weekend. And, we were doing interviews with many of the drivers, and I was on the way to another interview — we were looking for [driver] Johanna Long's trailer — and the NASCAR publicist called Mr. Clements over and asked him for help finding her," Beckerman said. "He walked us toward where she was, and on the way over, I explained to him that Guy Code is rules for guys, how you treat your friends, how you treat your ladies, things like that. I was there to do a humor piece, so I asked him what would be Guy Code for race car drivers, and he blurted out [a phrase that used the n-word]." Emphasis mine. The story did not illustrate exactly what was said. Clements' comments did not appear on MTV's Guy Code blog, which featured several stories from Daytona. Beckerman stressed that Clements' comments did not address any specific driver, but was merely referencing racing in general, which jibes with what ESPN reported yesterday. So why didn't Clements not report the remark? Because he's not that kind of journalist, he explains in the story. Beckerman said, since returning from Daytona, he had debated whether to publish a story around the quote. On Thursday morning, while discussions continued with Guy Code editors, he was contacted by a NASCAR rep who informed him about Clements' suspension. "We had not even intended to necessarily publish it, because our site is a humor site for men, we aren't the New York Times, we aren't investigative journalism. It didn't fit with our blog," Beckerman said. "The fact is that NASCAR made this a national story, and then Clements explained a bit of what he said to ESPN ... I never wanted to be part of the story." Get it? MTV says It's NASCAR's fault.